"Santos-Febres and 13 other contributors of Puerto Rican heritage take full advantage of San Juan's wide range of disparities between rich and poor, weak and powerful, tourists and residents, in this fine addition to Akashic's noir anthology series." 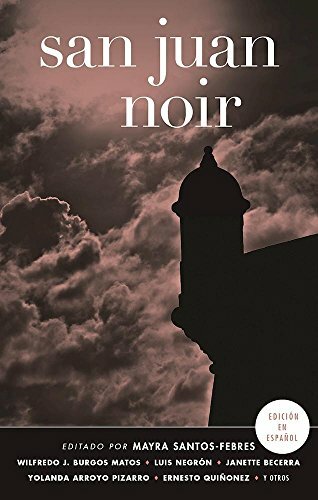 "A welcomed addition to the publisher's popular noir series, San Juan Noir has the distinction of being issued in two editions, English and Spanish, to more accurately reflect the Caribbean island's bilingual culture. Editor Santos-Febres gathers a varied collection of stories she expects will 'reveal a side of Puerto Rico otherwise obscured by the tourist trade and preconception.'" "The stories within San Juan Noir stare right into the face of colonialism as they examine the gaps between the city's rich and its poor, its residents and its constant flow of tourists, its colorful exterior and its gritty underbelly. This is noir with a bite, noir that enthralls with its dark tales even as it challenges the reader--do better, do better, do better." "From the interiors of sleazy bars or chic resort hotels, shabby apartments and in open streets and avenues with no escape, the tales of San Juan Noir trace the doomed routes of their victims and villains with an acute social and tragic awareness. These journeys keep the reader transfixed and understanding this Caribbean city in entirely new ways." Brand-new stories by: Wilfredo J. Burgos Matos, Ernesto Quiñonez, Mayra Santos-Febres, José Rabelo, Luis Negrón, Yolanda Arroyo Pizarro, Ana María Fuster Lavín, Janette Becerra, Manolo Núñez Negrón, Tere Dávila, Edmaris Carazo, Alejandro Álvarez Nieves, Charlie Vázquez, and Manuel A. Meléndez. Translated by Will Vanderhyden. "Puerto Rico is often portrayed as sandy beaches, casinos, luxury hotels, relaxation, and never-ending pleasure--a place that satisfies all senses and appetites. I hope these stories spark your imagination, and reveal a side of Puerto Rico otherwise obscured by the tourist trade and preconceptions. Maybe it will also pique your curiosity, and you will come visit our 'pearl of the Caribbean.'" If you have any questions about this product by Akashic Books, contact us by completing and submitting the form below. If you are looking for a specif part number, please include it with your message.